I am a researcher with the Medical Devices team at Microsoft Research where we are exploring new devices, algorithms and software for recording meaningful physiologic signals from the human body and using those signals to help people get healthier. I received my PhD from Bioengineering department at UW, where I worked with Jeff Ojemann of the Neurosurgery department and Rajesh Rao of the Computer Science department. From the 10,000 foot view, my research centered around how we can make brain-computer interfaces work better; specifically, I focused on how distributed (i.e. extra-motor) population-level cortical signals can be leveraged to make BCIs more effective. This was a neat line of work, because it combined machine learning, software development and cognitive neuroscience – with a bunch of digital signal processing, data science and circuit design thrown in. Previously, I received two B.S. degrees in computer and electrical engineering from North Carolina State University in Raleigh, NC. After completing my undergraduate work, I was fortunate to have a variety of adventures before begninning graduate school. I worked in a research lab in Milan, Italy helping develop an automated stroke rehabilitation system. I also worked for a biopharmaceutical OEM in Raleigh, NC, played music professionally, and spent a year and a half building homes for impoverished families in Costa Rica with my awesome wife, Leslie. When I’m not hanging out in Redmond, I have a variety of fun activities that keep me busy, including building things out of wood, and playing as much ultimate frisbee as possible. I am a builder of things. I have a small, but capable shop in my basement, and have built a number of woodworking projects. I have also combined my interest in building with neural engineering and built a variety of outreach goodies. If you’re interested in building something similar and want code / designs / sketchup models / etc, please don’t hesitate to email. 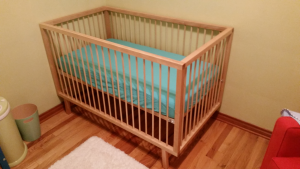 2015: I’m an uncle now, so I welcomed my niece into the world with a birch crib. It was a fun build, my mom did a lot of the sanding and it was great to work in the shop with her on a project. Almost had to cut the thing apart though to get it down the hallway in my sister’s house. Lesson learned: include installation plans in the design phase. 2014: Merry Christmas to the Bauders. 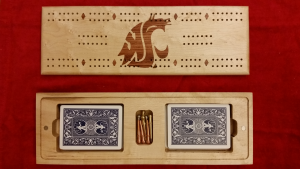 This cribbage board was my first attempt at building something using a CNC mill. It’s made of birds-eye maple body with bubinga accents. After a little bit of fiddling with the mill, I ended up with a result that we were all super happy with. 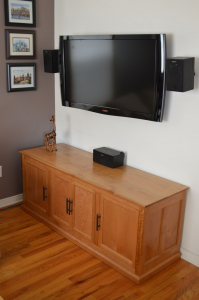 2014: To pair with the credenza below, I built a low-boy entertainment center . It also involved many lessons learned, including my first attempt at using hardwood ply (which worked beautifully), but I am happy with the result. I ended up using an IR repeater, so all of the gadgets inside can stay behind closed doors and still be functional. 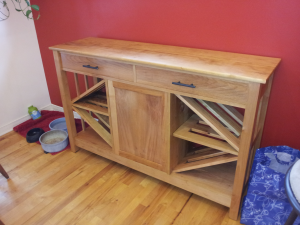 2013: This credenza was the most daunting woodworking project I’d done to date, but I’ve had a great time with it. Lots of lessons learned, etc. It ended up being nearly 100 boardfeet of cherry and holds approximately two cases of wine, as well as whatever Leslie wants to put in the drawers and single cabinet in the middle. 2013: WrestleBrainia3000 is a competitive biosignal-based virtual arm-wrestling game. Dev Sarma, Vivek Paramasivam and I built it for the first-annual Tech Sandbox competition at the CSNE. It records EMG from two users and, normalizes each signal independently, and maps a differential control signal to two robotic, pink monkey arms. Since the competition, the poject has generated a ton of interest: In the past 4 months, it’s been taken to a few outreach events and used by over 1000 kids; we’ve gotten some press. 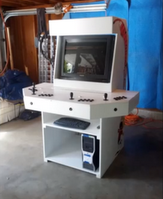 2013: I helped my friends Iris and Rich put together this behemoth MAME Arcade Emulator . Iris designed the cabinet to be modular so that it could eventually get moved out of their basement, and it’s built out of particleboard and pine. If you think it looks like it has a lot of buttons, you’re absolutely right, it does. It supports 4-P, 8-button gameplay. 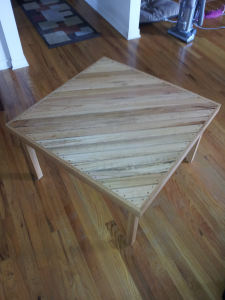 2012: Using some of the oak flooring left in our house by the previous owners, I built this Coffee Table . Thanks to mom for all of the sanding she did getting the pegs flush with the table top. It features splined mitre joints and is finished with a pecan colored stain and oil-based polyurethane. 2012: An entry table . This is the second project I did with left-over oak flooring, implementing some of the lessons learned from the first go around, and leveraging my new (at the time) jointer and planer. The milling accuracy of the components of this piece were my best to date, and it really made a difference during assembly and glue up. Finished with a pecan colored stain and oil based polyurethane., it seems to be standing up to all of the wear and tear we can give it. 2010: This EMG-controlled RC Car was really the first instantiation of WrestleBrainia. Similarly, it records EMG from a research-class biosignal amplifier, performs some feature extraction and signal processing, and sends a few derived control signals over WiFi to an arduino-based RC car. I built this with Lise Johnson just as the CSNE was ramping up so they had a neat outreach toy to show off. Here’s a YouTube video showing it in action. I apologize for the low quality. 2010: My first woodworking project here in Seattle, was this couch table that I built to use a big plank of cedar that I had lying around in my shop. 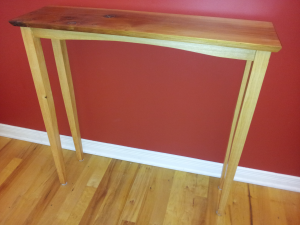 The legs and skirt are built out of poplar and joined with mortise and tenon joinery. 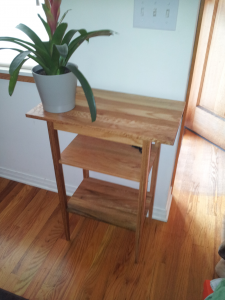 This was built before I had much of a shop put together, so I made it all with a circular saw and a free-hand router. Yikes. 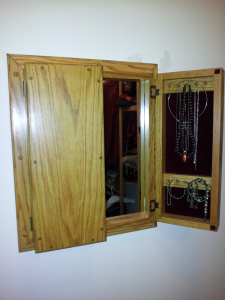 2008: This jewelry cabinet was my first real woodworking project, and I built it to give to Leslie as a wedding present. It is solid oak, with felt and a mirror inside. The case is joined with through dovetails, and the dummy that I am, I made the whole thing about 14 inches wide, so I had to build the mitred molding so I could mount it to the studs. PDF version of CV available for download. Researcher in the Medical Devices group of Microsoft Research. Develop and evaluate next-generation sensing technologies and platforms for clinical-grade non-invasive monitoring of cardiovascular health. Researcher working in an interdisciplinary, collaborative research group advised by Dr. Jeff Ojemann and Dr. Rajesh Rao. Utilized brain-computer interfaces to investigate various phenomena of the central nervous system, including novel task learning, neural plasticity, volitional modulation of cortical activity and control of external devices. Developed extensive technical expertise in biosignal amplification and digitization, digital signal processing and big data mining and management. Mentored REUs through the CSNE ERC as well as other undergraduates and acted as liaison for my research group in many collaborations with other research teams. Developed an Android OS-based brain-computer interface research platform. Extensively involved with the UW’s Neural Engineering ERC, the Center for Sensorimotor Neural Engineering. Developed a suite of real-time algorithms for automated signal quality identification of ambulatory heart rate and pulse signals, utilizing machine learning and other statistical methods. Designed and completed an 11-subject study for the purposes of algorithm training and verification. During the 12 week internship was tasked with developing proficiency in the field of heart rate sensing, generating a focused research question, collecting data, developing algorithms, and authoring of a publication to present our findings. Volunteered full-time for a non-profit housing and education initiative in Costa Rica. Planned and executed a multi-home construction projects with a budget of approximately $250,000. Was accountable for scheduling and achieving project milestones. Managed a multi-lingual team of five professionals, 20 construction workers and multiple volunteer groups. Participated in all phases of construction, and was the principal electrician on the project. Tutored university-bound Costa Rican students in math subjects ranging from arithmetic to calculus. Performed power systems and automation control development, assembly and testing roles for OEM biopharmaceutical filtration skids. Lead technical engineer and programmer for RSLogix-based control system, HMI and SCADA (supervisory control and data acquisition) systems development. Utilized GAMP manufacturing practices and was heavily involved in documentation assembly and verification for FDA approval processes. Heavily utilized AutoCAD for both mechanical and electrical design. Programmed, troubleshot and developed standard practices for a Motoman automated assembly robot. Performed duties as project lead on a number of filtration-related projects and coordinated efforts between NCSRT, its vendors and/or customers. Conducted customer demonstrations and onsite certifications and installations. Due to the small nature of the company gained various experiences in everything ranging from mechanical engineering to marketing, including work flow, quality inspection, and purchasing. Developed data acquisition system for bionic device intended for the rehabilitation of stroke patients with impaired hand mobility. Engineered a biometric amplifier and data acquisition system to be used as a portable EMG for servo control and progress measurement. Primarily Italian-speaking work environment. Application development in Java and C for embedded platforms, primarily in device interfacing and navigation systems. Coded from hardware control stack to Application and UI levels. Created a testing framework for our department’s products. Constructed software package tutorials. Mentored new Co-ops. Developed hardware proficiency working with a wide variety of devices and microprocessors. Was the sole teaching assistant for an interdisciplinary course on computational neuroscience. Course topics ranged from compartmental axonal models to BCI decoding methods to artificial neural networks. Students came from diverse backgrounds and successful teaching required effective communication of the background knowledge that was appropriate to each student. 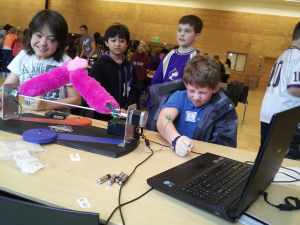 Built an EMG-based, competitive virtual arm wrestling device as a demonstration of neural engineering principles. Using this device, participated in numerous outreach events for K-12 students from a variety of backgrounds. These events included the National Science and Engineering Fair in Washington DC; Brain awareness week in Seattle, WA; and the PAWS on Science festival in Seattle, WA. Have had the opportunity to present and discuss principles of neural engineering more than a thousand young students. JD Wander, et al. (2013) Distributed cortical adaptation during learning of a brain–computer interface task. Proceedings of the National Academy of Sciences. L A Johnson, J D Wander, D Sarma, D K Su, E E Fetz and J G Ojemann (2013). Direct electrical stimulation of the somatosensory cortex in humans using electrocorticography electrodes: a qualitative and quantitative report. Journal of Neural Engineering, 10(3), 036021. JD Wander, JD Olson, JG Ojemann, RPN Rao. Cortically-derived error-signals during BCI use. Proceedings of the 13th Annual BCI Meeting, Asilomar, CA, June, 2013. J D Wander, RPN Rao (2014). Brain-computer interfaces: a powerful tool for scientific discovery. Current Opinion in Neurobiology. JD Wander, D Morris. A combined segmenting and non-segmenting approach to signal quality estimation for ambulatory photoplethysmography. Journal of Physiological Measurement, 2014. JD Wander, RPN Rao, JG Ojemann. Multiple roles of ventral premotor cortex in BCI task learning and execution. Proceedings of the 6th International Brain-Computer Interface Conference, Graz, Austria, 2014. H Sun, TM Blakely, F Darvas, JD Wander, LA Johnson, DK Su, KJ Miller, EE Fetz, JG Ojemann. Sequential activation of premotor, primary somatosensory and primary motor areas in humans during cued finger movements (2015). Clinical Neurophysiology. JD Olson, JD Wander, F Darvas. Subdermal recording of high gamma cortical signals for brain machine interfacing. Proceedings of the Annual meeting of the Association for Academic Physiatrists, San Antonio, March, 2015. KE Weaver, JD Wander, AL Ko, K Casimo, TJ Grabowski, JG Ojemann, F Darvas. Directional patterns of cross frequency phase and amplitude coupling within the resting state mimic patterns of fMRI functional connectivity (2016). NeuroImage. K Casimo, F Darvas, J Wander, A Ko, T Grabowski, E Novotny, A Poliakov, JG Ojemann, KE Weaver. Regional patterns of cortical phase synchrony in the resting state (2016). Brain Connectivity, doi:10.1089/brain.2015.0362. JD Wander, D Sarma, LA Johnson, EE Fetz, RPN Rao, JG Ojemann, F Darvas. Cortico-cortical interactions during acquisition and use of a neuroprosthetic skill (2016). Plos Computational Biology, in press. JD Wander, T Blakely, LA Johnson, F Darvas, KJ Miller, RPN Rao, JG Ojemann. Dynamics of distributed cortical activity demonstrated over the course of learning to use a brain-computer interface. Proceedings of the 42nd Annual Society for Neuroscience conference, New Orleans, LA, October, 2012. L Johnson, JD Wander, C Dickey, S Marihugh. Wireless EMG-controlled car: a demonstration of sensorimotor neural engineering. Proceedings of the 42nd Annual Society for Neuroscience conference, New Orleans, LA, October, 2012. KE Weaver, JD Wander, EJ Novotny, T Grabowski, TM Blakely, JG Ojemann. High gamma suppression in the default mode network in children: electrocorticographic findings. Proceedings of the 42nd Annual Society for Neuroscience conference, New Orleans, LA, October, 2012. H Sun, T Blakely, F Darvas, JD Wander, KJ Miller, and JG Ojemann. Temporal interactions between somatosensory and motor cortices during cued finger pinch movement in humans. Proceedings of the 19th Annual Meeting of the Organization for Human Brain Mapping, Seattle, WA, June, 2013. JD Wander, DP Sarma, JD Olson, KJ Miller, T Blakely, RPN Rao, JG Ojemann. Cortical representation of cognitive state in a graded-difficulty BCI task. Proceedings of the 43rd Annual Society for Neuroscience conference, San Diego, CA, November, 2013. H Sun, T Blakely, F Darvas, JD Wander, LA Johnson, D Su, KJ Miller, EE Fetz, JG Ojemann. Sequential activation of premotor, primary somatosensory, and primary motor areas in humans during cued finger movements. Proceedings of the 43rd Annual Society for Neuroscience conference, San Diego, CA, November, 2013. JD wander, DP Sarma, V Paramasivam. Competitive EMG-based gaming platform as a demonstration of the principles of sensorimotor neural engineering. Proceedings of the 43rd Annual Society for Neuroscience conference, San Diego, CA, November, 2013. JD Olson, JD Wander, K Weaver, DP Sarma, F Darvas, JG Ojemann. Electrophysiological representation of proprioception in the cerebral cortex. Proceedings of the Annual meeting of the Association for Academic Physiatrists, Nashville, TN, February, 2014. JD Wander, RPN Rao, JG Ojemann. 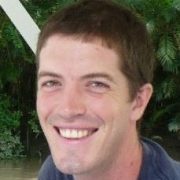 Multi-region goal inference improves performance in an invasive brain-computer interface task. 1st Annual Neurofutures conference, Seattle, WA, June, 2014. JD Wander, D Sarma, K Weaver, RPN Rao, JG Ojemann, F Darvas. Non-linear cortical interactions during brain-computer interface use. Proceedings of the 44th Annual Society for Neuroscience conference, Washington, DC November, 2014. Sarma D, Wu J, Kumar V, Wander JD, Blakely TM, Todorov E, Ojemann JG, Rao RPN. Novel electrocorticographic brain-computer interface framework for dexterous robotic control. Proceedings of the 44th Annual Society for Neuroscience conference, Washington, DC November, 2014. Multiple workshops at the 1st annual Indian Winter School and Conference on Computational Aspects of Neural Engineering. Indian Institute of Science, Bangalore, India. December, 2012. “Improving functionality of semi-invasive brain-computer interfaces through novel input and output pathways” Research Seminar Series – Neurodevelopmental Disorders Research Consortium, Center for Integrated Brain Research, Seattle, WA. November, 2013. “Advances in semi-invasive brain-computer interfaces at the University of Washington” International Workshop for the Cognitive Development of Friendly Robotics, Italian Institute of Technology, Genoa, Italy. December, 2013. An avid woodworker; Fluent in Spanish; GAMP4 certified; Trained on NEC2005; Proficient with MATLAB, Java, C++, C; familiar with Perl and PHP; Experienced in Android OS device development; Expert in MATLAB and biosignal analysis; Proficient with AutoCAD, Adobe Create Suite, the Eclipse IDE, Microsoft Visual Studio, Microsoft Office Suite, GIMP, SketchUp, and Tucker Davis RpvdsEX/OpenEX; Enjoys motorcycle riding, snowboarding, climbing, and fishing; Toured the Eastern US as a professional musician.